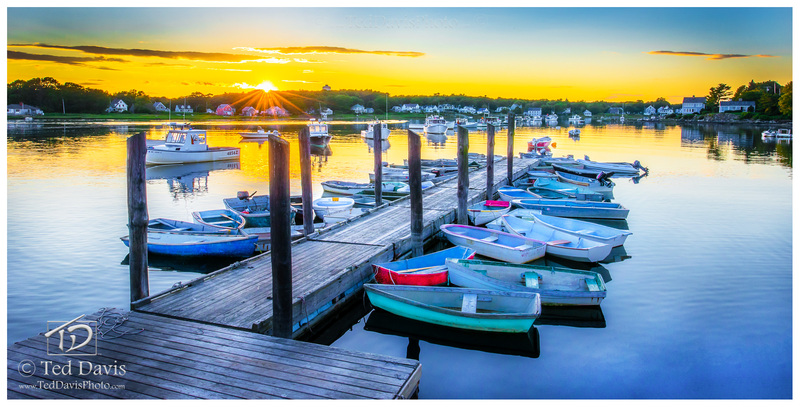 With the sun setting over the harbor, I desperately wanted a shot with the dinghy's all lined up and ready for the next morning's lobster haul. Cape Porpoise isn't known for much photography but I had lived there for years growing up and knew exactly what I wanted. With a slight breeze drifting across the inlet just as the sun touched the far treeline across the harbor, I had the shot. As the sun's golden light refracted through the top of the trees, a two second exposure captured a 180 degree sunburst made possible by the slightest of winds moving the leaves in the uppermost branches. This is one of my favorites, of a time when life was a little slower and it was all about the simple things. Photo © copyright by Ted Davis.